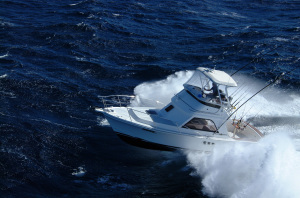 The Black Watch 36 is designed to be a true convertible blue water cruiser; a first class fishing boat with décor and accommodation for family cruising and entertainment. The cockpit is very large and gives an organised working platform for the serious game fisherman or alternatively plenty of room for comfortable outdoor entertaining. 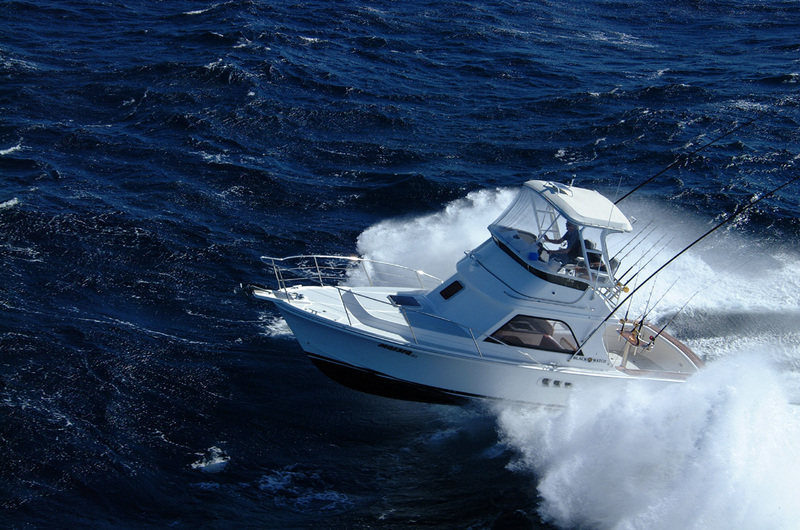 With big transom door, heavy duty swim platform and storage plus built-in live bait tank everything is at your convenience for easy fishing and cruising. Cockpit combings are padded with heavy duty rod holders and a large cockpit fridge and storage drawers. Wide side decks give easy access to the bow for sunbaking on a large flat surface also suitable for a davit and dinghy. The Black Watch 36 offers stunning performance at sea, stemming from its excellent heritage. 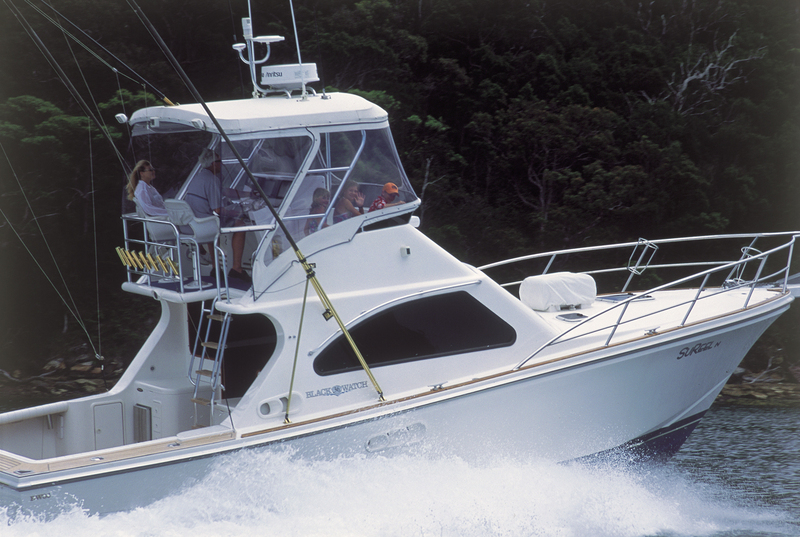 The fine bow and 18 degree transom deadrise give the vessel dry, soft riding and very stable characteristics. The Black Watch 36 will run into very rough seas and still maintain a cruise of over 20 knots. With standard 330 horse power the boat will easily launch on to the plane and reach an approximate top speed of 30 knots. With the Black Watch 36 it is possible to weave and pick your way through the seaway keeping the boat dry and passengers comfortable. 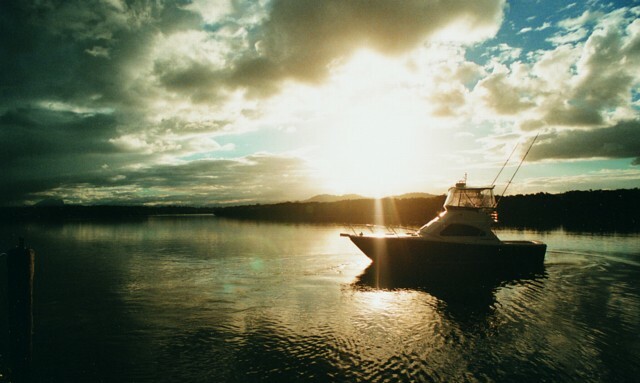 In a following sea our proven hull shape gives a sensational ride with no tendency to self-steer. It is possible to run at speed in the worst of conditions. Into a head sea, the bow down trim lets the fine bow do most of the work. Our hulls push deep into the wave before the whole boat rises rather than just the bow. The Black Watch hull can be trimmed down by the bow without the speed or fuel consumption being affected. It should be noted that a lot of our charter operators have noticed a dramatic decrease in fuel consumption compared to that of their previous boats. The Black Watch 36 has a comfortable twin cabin layout. In the forward cabin is a double berth set to the starboard side with hanging locker in the aft corner. On the starboard side is a guest cabin with upper and lower single bunks and ample space in the rear hanging locker. Opposite the second cabin is a large bathroom with separate shower stall. Stepping up into the main saloon there is a bar area to port and a large galley to starboard. The galley has a large stainless steel sink, microwave and 240 volt cooktop. A standard 240 volt inverter is fitted to power the galley appliances or other A/C equipment. Across the front main bulkhead face are two teak cabinets which contain TV/video and the CD Stereo. Aft and to port in the saloon there is a full length settee that converts easily to a double berth. Opposite is an L-shaped dinette, which can seat 4 or 5 comfortably. Overall the interior is well laid out to take advantage of the space available. Under all the bunks, dinette and settee is storage in addition the cavernous dry storage area under the galley/bar sole. This area contains the hot water service, battery switches, inverter, and battery charger. Black Watch Boats have a dedicated team of craftsman who use the most up to date boat building practices to create one of the best boats in the world today. Black Watch hulls are built tough. Our engineering is superior. The finish is superb. Come and see for yourself today!